A great kit for making terminations in 110/66 panels and cross-connect systems. Featured is the Klein cushion-grip impact punchdown tool. Easily adjust the impact force with a hi/low setting on the handle. The integrated extra-long shaft is designed to reach into bulky crowded blocks. The cushion grip handle reduces and hand fatigue and adds comfort. The 110/66 blades are metal injection molded (MIM) for a precise cutting edge and better performance. A twist-lock design holds them securely in place. This kit also includes an insulated probe pick tool for removing wires debris with a hook and spudger end. Store this kit conveniently on your belt with this tough nylon clip-on pouch. 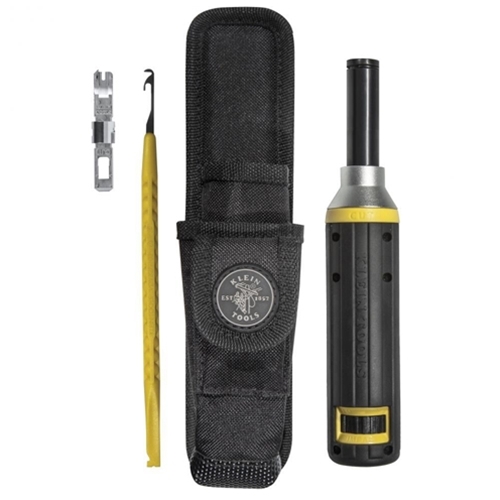 The multi-pocket design stores tools separately and features a puncture resistant bottom.